I have some Georgia ancestors who, for some reason, up and moved late in life. Or who had random land half-way across the state in their estate records. Why on earth would they move like that or have than random land? Because they won the lottery. In the early 1800s, Georgia was expanding. In 1802 the western boundary of the state was established, though much of it was land belong to the Cherokee and Creek Native Americans. As we all know, this land was taken piece by piece. Once it was taken, the state government wanted to fill it with white settlers.... or cannon fodder. Depends how you want to look at it, I guess. And of course, there were a ton of young families looking for land to building their lives on. The easiest way to settle Americans in the newly acquired land was to simply give it away. Georgia used a lottery system and in 1805, 1907, 1820, 1821, 1827, 1832 (twice) and 1833, citizens received land. You could purchase a ticket in the lottery if you met certain criteria, which changed each time. Searching for your ancestors in the lottery is a great way to find out if they fought in a war, were a widow, an orphan, or of a certain age. Also, if you have an ancestor who lived in Georgia and simply disappeared around this period, it might be that they won some land and moved. If you suspect that your John Smith from Elbert County is the John Smith who is suddenly living in Gwinnett County in the 1830 census, that might be because he won land there during the 1820 lottery. Lottery records can help confirm your theory. Researching these records can be a bit confusing. There were a lot of lotteries and a ton of records created through the process. 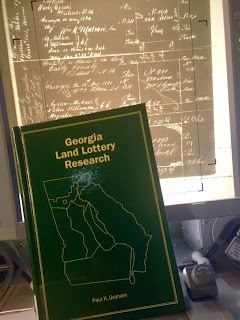 I highly recommend the book, "Georgia Land Lottery Research" by Paul K Graham, to help figure things out. It's on the shelf at the Georgia Archives, next to the books that index the winners. The book has information on requirements for each lottery, maps of the land given away and, best of all, tells you the exact drawer and box of the microfilm you need. And for each person you want to look up, you'll need to pull a series of four different films. See why you need the book? One last hint, which I picked up from a fellow researcher while a friend and I were trying to figure out the lotteries: some books just list the winners. If you can find it, look for indexes of eligible drawers, not just fortunate winners. Even if you ancestor didn't win, you'll find out a bit about then simply knowing that they were eligible.